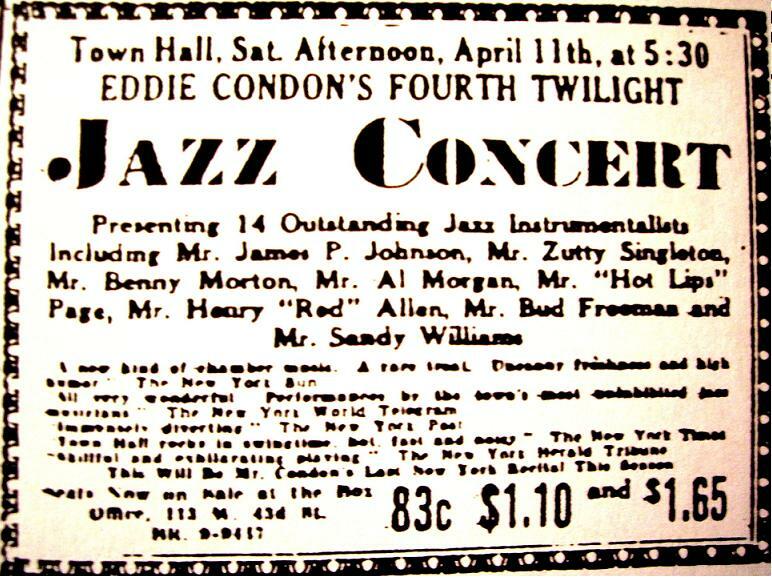 I don’t ordinarily join in the chorus of people celebrating the birthdays of those who have left us, but, “from Ketchikan to Calcutta,” we can all salute Eddie Condon, who was born November 16, 1905. . . . with a little music, as he would have liked — in this case, an AFRS transcription of a Town Hall concert from September 9, 1944. The collective personnel, as explained by Mister Condon — from the hallowed and gilt-edged Town Hall — is Max Kaminsky, Muggsy Spanier, Billy Butterfield, trumpet / cornet; Miff Mole, trombone; Pee Wee Russell, clarinet; Ernie Caceres, baritone saxophone; Gene Schroeder, Bob Haggart, bass; Condon, Gene Krupa, Joe Grauso, drums. I have a wall of CDs, and a good many of them are by Eddie Condon and his friends, but I would certainly love to live in an alternate universe where on a Saturday afternoon I could be sure of turning on my radio and hearing a half-hour of this splendor. Note: the music from this transcription — without the AFRS “fillers” at the end can be heard, in better sound quality, on Volume Five of the comprehensive Jazzology Records series of Condon concerts 1944-45, more than twenty CDs in all. This one’s for Hank O’Neal — who enabled many of us to hear the Town Hall concerts for the first time — and for Maggie Condon, for many reasons. This entry was posted in "Thanks A Million", Bliss!, Generosities, Hotter Than That, Ideal Places, Irreplaceable, It's All True, Jazz Titans, Mmmmmmmmmmmmm!, Pay Attention!, Swing You Cats!, That Was Fun!, The Heroes Among Us, The Real Thing, The Things We Love and tagged Benny Morton, Billy Butterfield, Bob Haggart, Ernie Caceres, gene Schroeder, Hank O'Neal, Jazz Lives, Jazzology Records, Joe Grauso, Maggie Condon, Max Kaminsky, Michael Steinman, Miff Mole, Muggsy Spanier, Pee Wee Russell. Bookmark the permalink.